As residents of the Heygate estate discovered, early regeneration promises made to those pushed aside are seldom kept, but the scale of the unfulfilled committments made by Southwark to the independent small traders at the Elephant & Castle shopping centre puts the Heygate into the shade. The committments are made in a Business Continuity Charter, drawn up by the head of regeneration and recommended to Southwark’s Executive Committee in 2007. (NB The Executive then included Cllr Kim Humphreys. As plain Kim Humphreys, he now works on behalf of shopping centre developer, Delancey 1). The Business Continuity Charter gives a range of undertakings, designed to maintain small traders through the whole redevelopment process. The centre is to be maintained as an ‘attractive environment for customers’ and service charges will be kept at the lowest possible level, with a cap or freeze on rents. There will be funding for independent legal advice on leases and tenancy matters and early release from tenancies, should that be needed. A compensation mechanism for ‘adverse impacts of the regeneration’ will be sought and when the time comes for moving, traders would get first refusal for both Southwark’s commercial retail units and those secured via section 106 agreements with its other development partners. Affordable retail units at discounted rents will be available. The report which presented the Charter even floats the idea of building new premises for displaced traders. 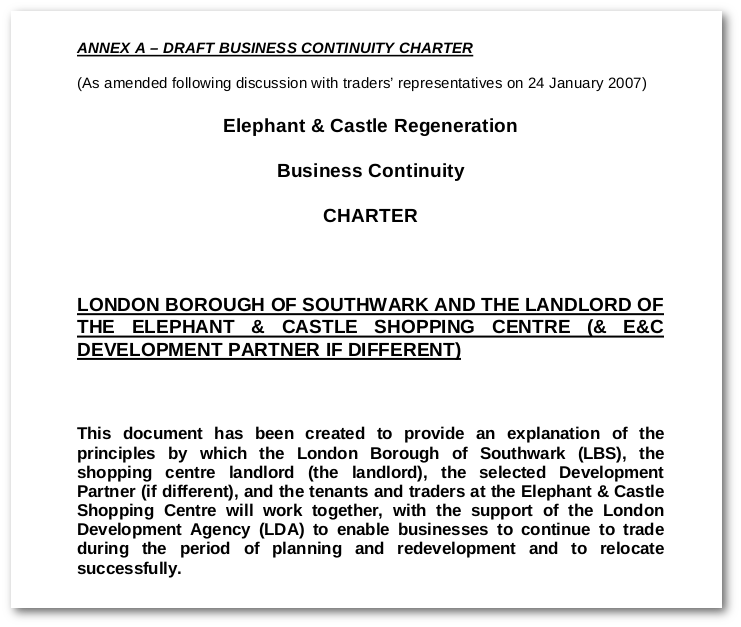 The Charter is a creditable attempt to help the traders, but this is Southwark, so, despite appearing in the Council’s 2012 planning policy framework for the Elephant regeneration, along with details of the rent subsidies, none of the Charter’s commitments have been fulfilled - no legal help, no compensation mechanism, no rent freeze, no offer of Southwark’s commercial premises, only rising service charges. 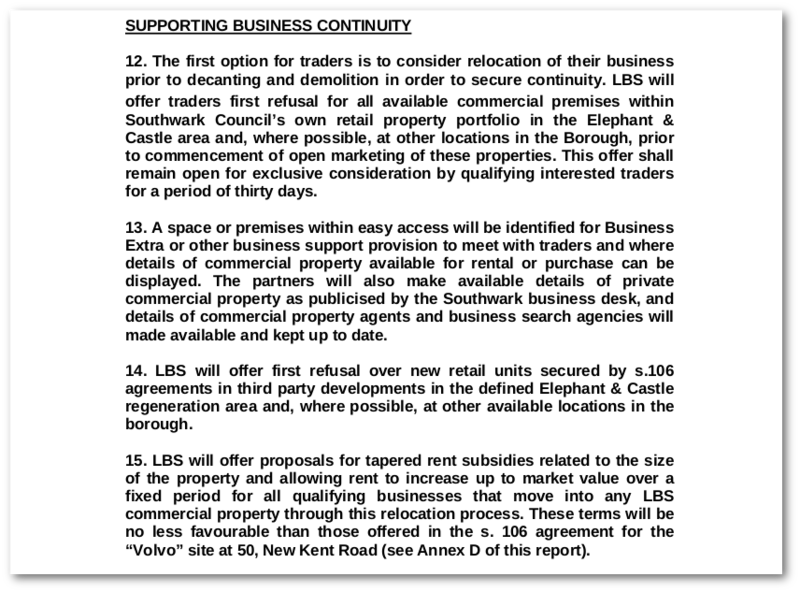 Furthermore, in its negotiations with Lendlease, Southwark failed to secure any of the 1,600 sqm of new ‘affordable’ retail in Elephant Park at the rent subsidies agreed in the Charter2. 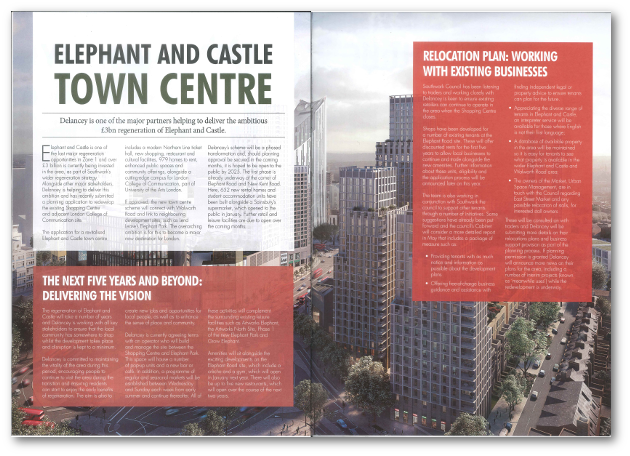 We have detailed elsewhere how Sainsburys barged small traders aside, denying them the most desirable location on Delancey’s Elephant One development, and how another prospective location, the Market Square has lost its market. Delancey also took the opportunity, while putting out the welcome mat for Sainsbury, to remove the option of preferential consideration for a free market unit from centre traders. Indeed it is hard to see how Delancey could make its distaste for the traders any clearer, short of taking out an advert in Southwark News. 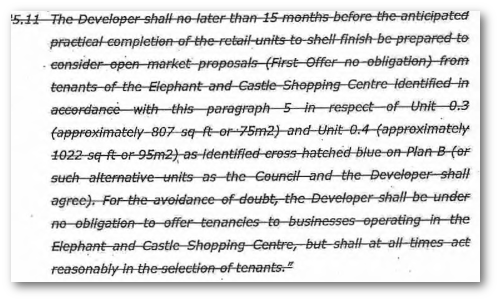 The 9 units of affordable retail that remain in Elephant One and which should have been given to traders 15 months before the scheme was completed remain empty. Delancey’s disdains to provide any affordable retail in shopping centre application and thumbs its nose at any relocation strategy. At a trader’s meeting last week Southwark said that there will be affordable units in Elephant One (but only seven) and that they have taken issue with Delancey about the lack of any affordable retail in its shopping centre plans and the lack of a relocation strategy for displaced traders. But Delancey are playing Southwark for fools and will be all the more encouraged having seen themselves flattered for their role at the Elephant and as Southwark’s development partner, in the Council’s Elephant Magazine. Southwark says it is going to consider how to support traders at a Cabinet meeting on 9 May - 10 years, 4 months and 9 days after it considered the Charter. There is only one thing that an honest and decent Council would do at that meeting and Southwark needs to repair its shredded credibility after the Heygate debacle. Southwark must honour the undertakings made in the Charter, with the cost met by Delancey through an S106 agreement. If Delancey does not do this (and also include 50% social rented housing in its affordable housing offer) Southwark must refuse its planning application. You can help us stiffen Southwark’s sinews by submitting an objection to Delancey’s plans using our web form.